The beautiful Greek island of Crete is one of those destinations that always impresses, even after several visits. Its beauty stems from the fact that it’s a very diverse island in every way – you have the calm elegance of the pristine beaches on one side, and then the rough and rugged terrain of the tall White Mountains. Crete has a modern and very welcoming aspect, while also ancient and medieval history pour from every nook and cranny. This type of diversity makes it an absolute must-visit, especially considering the amount of places to see and adventures to have. Any person that’s ever visited Crete can attest to its uniqueness. It’s not a small island at all, in fact it’s the fifth largest island in the Mediterranean, and the largest island in Greece. The sheer diversity of things to see and do is quite mind-boggling. One moment you’re chilling in one of those unique and gorgeous Crete villas, enjoying the not noon sun, and the next you’re off exploring one of Crete’s many caves, or taking a swim near palm trees. Whichever thing you do it’s bound to be an unforgettable experience. One of the biggest draws of Greece, and Crete in particular, is the vast amount of history that’s simply waiting to be explored. In fact, civilization on Crete is quite older even than the one on mainland Greece. Very near Heraklion, the main city of Crete, lie the old ruins of Knossos, the ancient capital of the Minoan civilization. Hailed as the oldest city in Europe, it was originally founded around 2000BCE, but people have reportedly lived there from even further ago in the Stone Ages. Knossos is most famous for the legendary king Minos, his palace and mazes, as well as the Minotaur, a mythical creature that has the body of a man but the head of a bull. Knossos was originally excavated in the early 20th century and still being excavated to this very day. If you have at least a slight interest in ancient history, places like Knossos are a must-see. Crete has had a colorful history, to say the least. Ancient history is only a part of what the island has to offer, because throughout the ages Crete has been under the control of several other nations, kingdoms, and empires – Rome, the Byzantine Empire, the Ottomans, the Republic of Venice, and even the German in the second world war. The Venetians held Crete for over 4 centuries, and in their time they constructed several mighty forts to help keep the island under their control. Today, large parts of them are still standing and are very much available to see from inside. The fort in Chania is one fine example – an old fort that’s now open as a museum, and allows entrance to the local lighthouse which is one of the world’s oldest lighthouses. Others like the ones at Heraklion and Rethymnon are amazing too, with museum and exhibitions inside that allow you to see for yourself just what the fortresses were like in the prime. Ever since ancient times the Greeks have used a very specific type of marketplace, which are known as Agoras. They’re present in every part of the island, and are quite unique in their presentations – they’re either completely open or slightly covered, and sell anything from fresh produce, to meat, clothing, fish, and various trinkets. They’re considered cultural hubs of a sort, and if you want to immerse yourself in the local culture, then there’s no better way to do so than at an agora. Almost always, there are cafes and bars scattered all around the agoras, and all of the sell local alcohol that you can rarely find anywhere else outside of Crete. They’re the heart and soul of the towns on Crete, and exude a certain ambience that can rarely be matched. The Greeks have been known for their exquisite wine since forever. There are specific grapes that grow on the island that just don’t grow anywhere else, and many locals have long standing traditions in making fine wine with unique taste. Because of troubles and turmoil in the past, wine had seen diminished production, but since the 1980s wine is constantly on the rise, both in production and quality. There are many local wineries that offer guided tours, and the entire experience is quite unique. It’s not aimed to be high class, but rather traditional, and in some ways rural. There may be exceptions, but that’s generally the case. Wineries like Lyrarakis Winery, Douloufakisa, and Manousakis, offer tours and wine-tasting for a small price, and the general consensus is that it’s absolutely worth it. The island of Crete is not a small island, but it’s also not exceptionally large. However, in any direction you see and go there’s beautiful, practically untouched nature everywhere. Crystal clear beaches with sandy shores on all sides of the island, rugged terrain that’s perfect for hiking and biking, and even activities like spelunking, diving, snorkeling, and all types of watersports are prevalent on Crete. Elafonisi beach is one such example – in the extreme southwest of Crete there’s an inlet that’s under active development to be made into one of the best tourist spots on Crete. Pink sands, pristine waters, and even endangered species like the Bearded Vulture, are the main attraction. Or if beaches aren’t your interest, then you can hike on the longest gorge in Europe – Samaria – situated in the national park of Samaria. 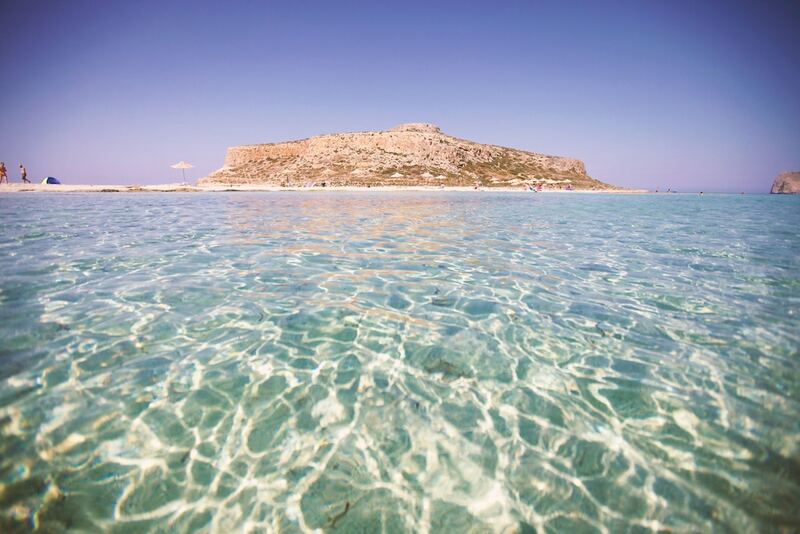 Or maybe have a trip to the unforgettable Gramvousa Island where you can find an old Venetian castle, or maybe take the time to see the Balos Lagoon. The point is, it doesn’t matter which side of the island you want to explore, there’s always an adventure waiting for you. Crete is a fantastic destination. Amazing culture, old history, pristine nature – you name it, Crete has it. And most important of all it’s very affordable, easy to reach, and once you’re there, you’ll immerse yourself in one of the most beautiful places the world has ever known.